Adverse Events Associated with Laparoscopic Colostomy Reversal Following Hartmann’s Procedure : A Multi-institutional Study. Background : Open restoration of bowel continuity after Hartmann’s procedure has been associated with significant morbidity, including anastomotic leak, incisional hernia, inability to re-establish intestinal continuity and wound infections. Few studies have examined the role of laparoscopy in performing Hartmann’s reversal. The aim of this study is to review our experience with laparoscopic colostomy reversal after Hartmann’s procedure with an emphasis on intra- and post-operative adverse events. Method : A prospectively collected laparoscopic colorectal database involving three surgeons in four academic centers between 1991 and 2008 was reviewed. All patients underwent a laparoscopic approach and there was no patient selection during this time interval. Factors evaluated are patient demographics, diagnosis, operative time, intra- and post-operative complications, recovery of bowel function and hospitalization length. Results : Twenty-eight consecutive patients (13 males), mean age 61.1 +/- 15.3, mean weight 72.3 +/- 20.1 kg, underwent laparoscopic Hartmann’s reversal. The diagnosis at initial surgery was complicated diverticulitis in 19 patients (67.9%), cancer in 6 patients (21.4%) and other in 3 patients (10.7%). Median operative time was 166.2 +/- 74.4 min and mean incision length was 4.5 +/- 1.9 cm. There were no conversions. There was one major intraoperative complication (bleeding) (3.6%). There were three postoperative complications (10.7%): one abscess, one prolonged ileus and one wound hematoma. Only one patient with an abscess required readmission and there were no observed clinical anastomotic leaks. All patients underwent successful reanastomosis. The median time for bowel function return was 4 days (3,4) (IQR). The median hospitalization length was 5 days (3.5,6) (IQR). There was no mortality. 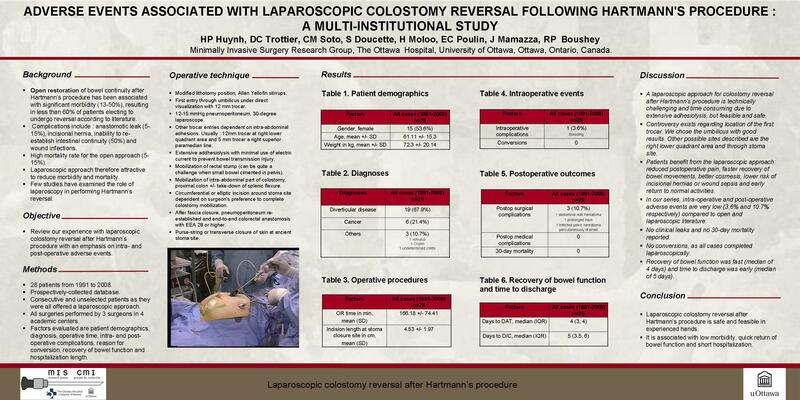 Conclusion : Laparoscopic colostomy reversal after Hartmann’s procedure is safe and feasible in experienced hands. It is associated with low morbidity, quick return of bowel function and short hospitalization.